Surely you’re aware of the Greek deck crisis that gripped the world this summer. It’s a little complicated, so we’ll break it down for you: there aren’t enough rooftop decks above Wicker Park’s Greek restaurants. 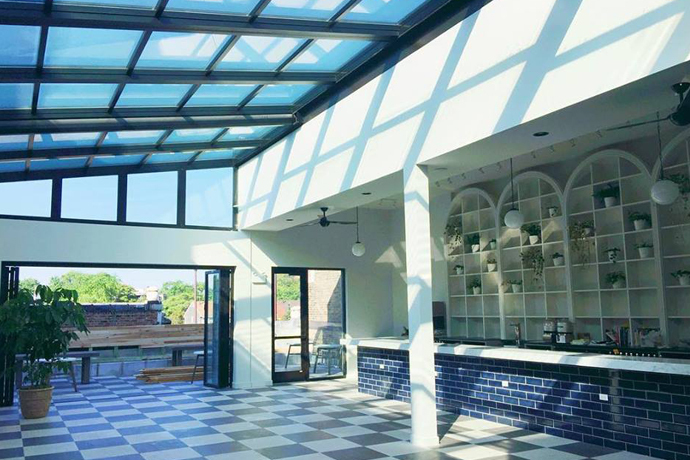 Here to lead you out of the abyss: To Hayati at Taxim, a magisterial perch above Milwaukee Avenue that’s opening tonight and looks an awful lot like this. Actually, this is being touted as the first rooftop deck anywhere in Wicker Park. So there’s that. You’ll enter Taxim and take an immediate right by the host stand. Once up a few flights of stairs, you’ll be rewarded with a rather Instagramable view of the Damen ‘L’ stop to the south and a setting that’s part herb garden, part hidden alfresco Xanadu and part place-where-you’ll-discover-the-joys-of-Greek-imbibery. Pop up here for a laid-back evening with someone special. Nibble on feta, olives, grilled pitas and skewers of roasted meats. Drink raki, a licorice-tasting liqueur. Eat ice cream flavored with rare orchids. Sip a bourbon-and-sour-cherry Varoufakis for President, named after ex–Greek Finance Minister Yanis Varoufakis. We’re almost certain it’s the only one in the world.